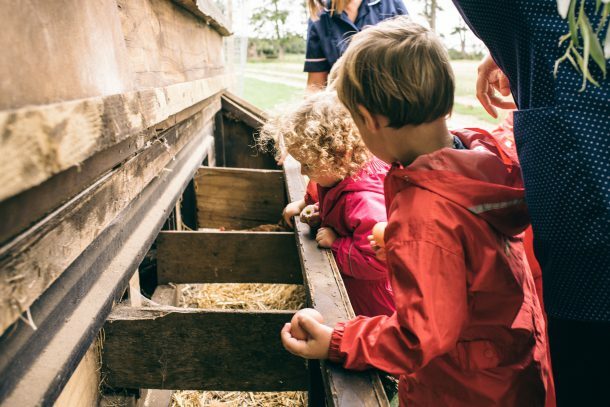 Being based on a working farm presents many fantastic opportunities for the children to experience nature up close and personal. This enables the children to see animals such as lambs and cows and learn more about the countryside. In addition, we also have a mini-farm area which was designed specifically with the children in mind. This comes complete with calves, piglets, sheep, ducks and hens. The children can visit the animals via a secure walkway created between the playground and farm area. Hand washing facilities have also been installed so the children can interact with the animals, including collecting the eggs laid by the hens and feeding the pigs and cows. This brings an added dimension to the nursery and has become an integral part of the learning journey children go through when they are at High Bank.